Is It Easy To Move A Screenflex Room Divider Through A Doorway? Here is a common question asked by our customers: Is it simple to move Screenflex room dividers through a doorway? The answer is Yes! Every divider is equipped with self-leveling casters that allow it to glide effortlessly across the floor whether it be carpet, wood or cement. Even uneven floor surfaces are no match for our wheelbase. Steve: Moving a Screenflex unit through a doorway is very simple. A closed Screenflex room divider is 25″ wide, a standard doorway is anywhere from 28″ – 36″ wide. Your room divider should always be in an upright position. During transportation, your divider should not lay horizontally. If your divider is taller than your doorway, slightly tilt your divider and roll through the doorway. 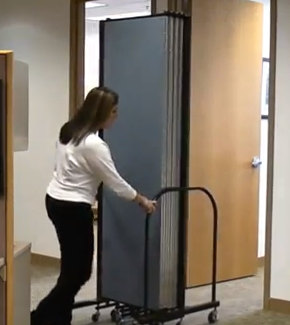 Safe for all floor types, Screenflex room dividers create portable space when you need it and where you need it. Providing a quick space for meetings, classrooms, religious education etc. Dividing any area large or small for any reason.